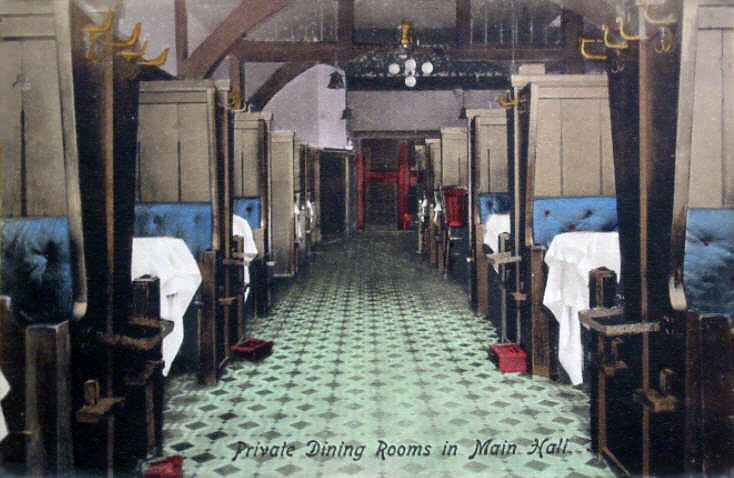 While so many of us love restaurant booth seating, how few of us know the history of it! Let's take a quick look at this iconic American tradition, shall we? While food had been prepared, cooked, and sold for as long as there has been civilization, public eateries consisted of either eating at the proprietor's own table or in private dining rooms. It wasn't until the 18th century that the French introduced the first modern restaurant (a French word BTW) by offering individual tables in the same dining room. By the end of the 18th century, though the United States had shrugged off its colonial status, it was still a British culture, and the English were fond of boxes for seating in both churches and opera houses for families or private parties. It was only natural that this preference would find its way into the new restaurants that were sprouting up, and by 1796, the first known advertisement for the privacy of box seating appeared from an establishment named “New Porter Cellar” in Boston, MA. It wasn't long before customers wanted to increase their privacy in these boxes, and restaurants obliged by providing curtains in front of them. While they were popular with some, other customers were distraught by what might be going on behind those curtains, and by the early 20th century, local authorities had enacted ordinances that prohibited the use of any screen or curtain in front of a restaurant or tavern box. Other municipalities even limited the height of the box walls. In 1914, an anti-prostitution crusade in Boston named the "White Slave Commission," demanded that the city prohibit public floor seating not viewable by anyone in the establishment. The prohibition of alcohol during the 1920s calmed the moral fears of the most prudish Americans long enough to allow the box to return for that roaring decade. Naturally, the restoration of public drinking after prohibition's repeal in 1933 resulted in renewed demands for tearing down those iniquitous boxes, but they had just become too popular with the dining public by that time, and restaurant owners successfully fought new requirements to remodel their interiors. The restaurant booth was here to stay. Before long, restaurants were advertising "cozy and intimate" booth seating, and restaurant supply stores were featuring leather and chrome custom restaurant booths in their promotional catalogs. Though restaurant booths would still generate suspicion and angst in the years to come, they had succeeded in becoming a fixture in the American dining experience. In the 21st century, custom restaurant booths are as popular as ever, and restaurateurs and hospitality professionals can still purchase American handcrafted furniture from our factory in New Jersey. We opened our doors in 1999, and we strive to provide our customers with a wide array of choices of different styles of booths including the standard, deuce, double, L-Shape, 1/2 circle, 3/4 circle. The majority of these models are fully customizable, which means we can make them to any size and with a choice of upholstery and metal finish.